Welcome to Dan Hill Sculpture.com, the online gallery and studio of Utah artist Dan Hill. 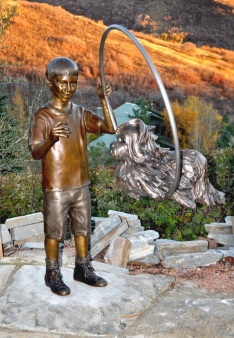 Known primarily for his life-size bronze sculpture of children and people at play, Dan's portfolio also includes sculpture of fishermen, skiers, snowboarders, mountain bikers, surfers, golfers, tennis, soccer, baseball and basketball players, ballet dancers, Santa Claus, a young falconer with his goshawk, a few dogs and four Lucky Cats. Browse the website to find perfect sculptures for your home, office, garden or patio. We also have sculptures that are perfect for public parks, schools, libraries and municipalities of all sizes. If you are interested in a sculpture commission, Dan has a special talent for capturing likenesses and emotions. Thank you for visiting and please enjoy your stay.